So the good news is that I enjoyed Part 2 of Season Five much more than Part 1. The main reason for that is we don’t get too many completely insane episodes is this collection. Aside from the Lemonhope two-parter towards the end, the majority of these episodes are just weird enough for the likes of me. Whether it’s Jake wearing Finn as a suit of armour and putting him in all sorts of painful situations…or Magic Man stealing Jake’s perfect sandwich, then sealing himself in a molasses bubble so to enjoy it over a period of days…or Finn going dungeon-crawling through an infinity train that runs on an endless loop, Adventure Time is my kind of silliness. There are some ongoing plot threads that are developed here also. We learn more about the Ice King (ahem, Simon) and Marceline’s past, we see the founding of the Candy Kingdom by Princess Bubblegum and there’s also the matter of Finn and Flame Princess’ ongoing relationship. Small things change too – Finn’s sword breaks in one episode, so he gets another one a few episodes later, which then features from that point onwards. This doesn’t sound like such a big thing, but in the world of 11-minute long cartoons, it’s surprising that they don’t hit the reset button at the end of every episode. For some reason I was only sent the DVD version of this release, and whilst the picture is as good as can be expected, I’d always recommend Blu-ray over DVD when it comes to animation. The quality of animation itself continues to improve, even though it’s always been impressive. This has to be one of the best-looking shows out there. The special features include short animatics for each episode – 20-90 seconds in length – as well as actual sheet music for one of the songs featured in the collection. I can’t imagine taking the time to learn to play “Lemonhope’s Got Feet” anytime soon, but it’s a nice addition. 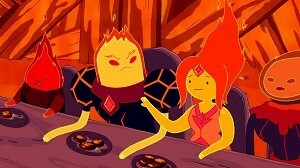 Adventure Time is still consistently entertaining after five seasons. I love the fact that they’re willing to spend time with the supporting characters, despite the fact that the show’s subtitle is “with Finn and Jake”. Here’s hoping the next collection is just as good. Writer: Jesse Moynihan, Thomas Wellman, Kent Osborne, Cole Sanchez, et. al.